LearnScience.Academy serves as a guide to the rich resources available for the homeschooling community at Conceptual Academy. Conceptual Academy, found at ConceptualAcademy.com, is a comprehensive web-based learning management system used primarily by colleges and universities for their liberal arts science courses. These college-level science courses are designed for students majoring in programs such as business, journalism, religious studies, or computer technology. Conceptual Academy was created and continues to be developed by the authors of the widely-used “conceptual” line of textbooks. 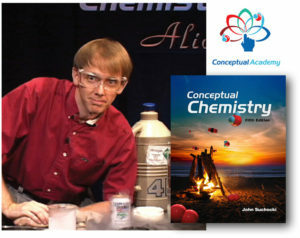 Hosting a growing library of over 500 of their video lectures, Conceptual Academy is essentially the “talking textbook”, which substitutes for the traditional class lecture. With Conceptual Academy, college students can “go home for their lectures” and come to class to “study” in an interactive environment with fellow students under the expert guidance of their course instructor. The authors’ textbooks and online video lectures have been popular among homeschoolers for many years. In developing Conceptual Academy, the authors also wanted to create tools to support this growing community. Toward this they developed a set of self-study science courses. Each of these self-study courses is essentially an entire college curriculum with automated quizzes and grade book included. In place of the college professor, the authors themselves step in to guide the student through the concepts. They do so not only through their textbooks, and video tutorials, but also “virtually” through what are known as the “From Your Instructor” (FYI) pages. It’s through these FYI pages that they offer study advice for each class, worksheets, chapter summaries, ideas for hands-on activities, and even unit exams. The homeschooling teacher serves the role of a coach who is there in person to inspire and to ensure the student remains on task. Through a Conceptual Academy self-study course the student has access to an already widely-used curriculum designed by well-established textbook authors with decades of classroom experience. There are many Conceptual Academy self-study courses from which to choose, each customized to meet the varied interests of students. For example, we currently offer four “flavors” of chemistry courses including three “customized versions” (life sciences, environmental chemistry, or college-prep chemistry) and the “full version” chemistry course covering the entire textbook. Look to the “Course Descriptions” menu for complete course descriptions. It’s not just that our self-study courses are comprehensive and affordable. Perhaps most notable is the top quality of the curriculum itself. The authors are as engaging within their textbook narratives as they are within their video presentations. This is why their curriculum is popular world wide having been translated into many languages. They are experts at simplifying otherwise tough concepts and providing insight into how these concepts are connected to each other and to the real world in which we live. Your student will be challenged but these challenges will be well-placed. There will be many joyful “ah ha!” moments of understanding as your student explores the science underlying the physical workings of this amazing and beautiful universe. With this top quality, your student will be in very good hands. This includes students seeking a strong foundation before moving to a science-oriented field as well as those merely seeking to be “turned on” by the joys of learning science.